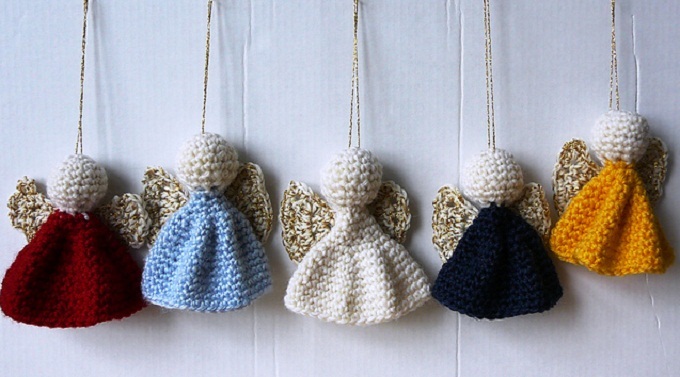 Today we will be following free patterns (both crochet and knitting) for these cute little Christmas angels. Crochet and knitting angels are one of the most popular projects for holidays such as Christmas and Valentine’s day. That’s why today I’ve decided to share with you free crochet and knitting patterns for these lovely angels. I think these patterns are excellent options for either of those celebrations to add some hopeful symbolism to your home interior. So, if you like these charming angel ornaments and willing to make them for this Christmas eve, here is everything you’ll need to make them in the best possible ways. Just follow the easy instructions and celebrate Christmas with these adorable angel ornaments. Please, enjoy your crafting and don’t forget to shae your experience with us in a comment section below. Good luck and happy holidays. These are small Christmas angel ornament patterns in different languages that work up really quickly, making them great as a last minute gifts or Christmas tree decoration items. Here you can find both, crochet and knitting patterns as a free Ravelry downloads. Angel Ornament Crochet Pattern by Roswitha Mueller, in four different languages. Angel Ornament Knitting Pattern by Liliane Stengel-Grimm, in two different languages.